The current sign on Tecumseh Road is difficult to see and needs to be updated to remove former tenants. EWR receives no government funding for operations, and all current fundraising supports the expenses for wildlife in care. Extra funds are urgently needed to update the sign and make it easier for people to find the Centre, and get orphaned and injured wildlife to the care they need. 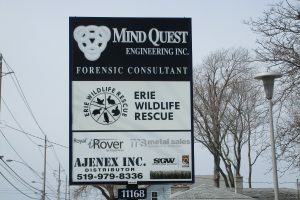 Visit GO FUND ME to make a donation; https://www.gofundme.com/erie-wildlife-rescue-sign. Donations can also be made at https://www.canadahelps.org/dn/6740, mail a cheque, or send an e-transfer to ewr@bellnet.ca. Receipts for tax purposes will be sent for donations over $10.